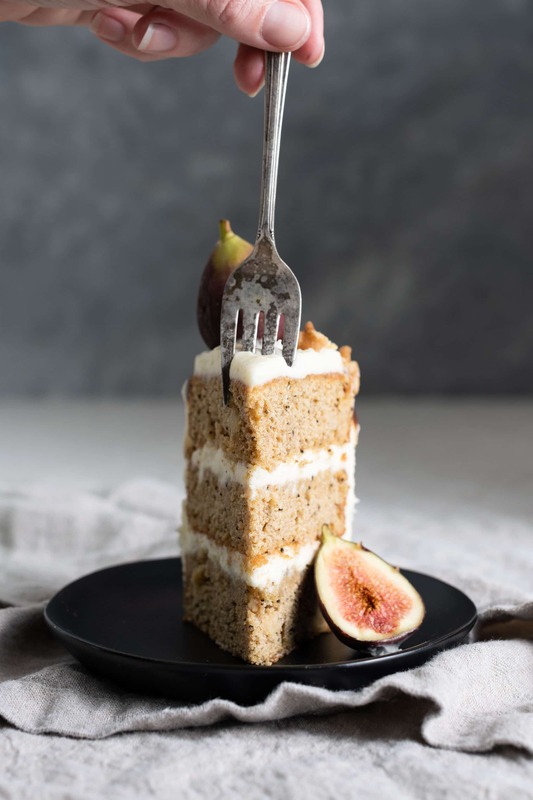 Chai Tea Apple Cake will get you in the mood for Fall and cozy evenings. 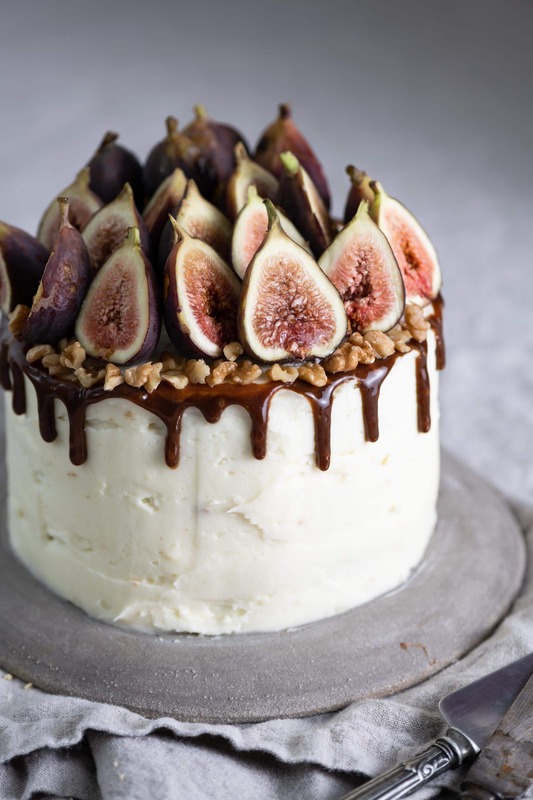 Three layers of soft apple spice sponge cake with maple cream cheese frosting, topped with fresh figs, walnuts, and a caramel drizzle. 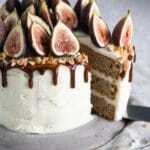 (Yes I did put some figs in the cake batter too!) I’m definitely the typical cool weather lover, who gets giddy when I see the first leaf change color. I want to wrap myself in a blanket, sit by the fire, and eat comfort food. 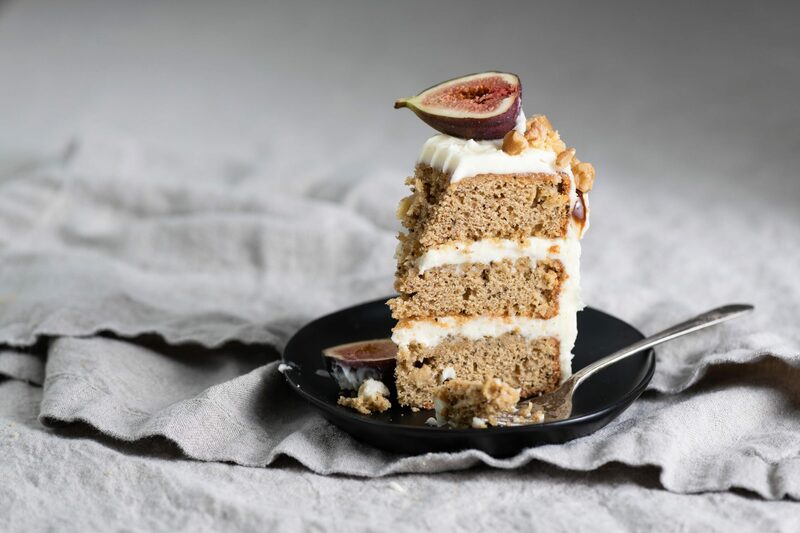 Chai is my favorite tea, granny smiths are my fav baking apples, and figs are delish, so..BAM I made a cake with everything! 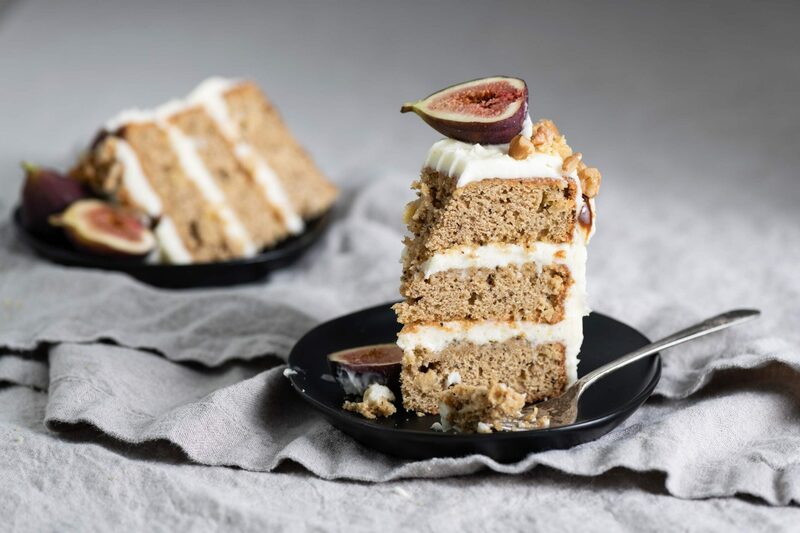 Chai Tea Apple Cake, three layers of soft apple spice sponge cake with maple cream cheese frosting, topped with fresh figs, walnuts, and a caramel drizzle. Preheat oven to 350°F (176 C). Grease 3 (6-inch) round cake pans and line bottoms with parchment. Whisk together flour, chai tea, cinnamon, nutmeg, and ginger in a medium bowl. In the bowl of stand mixer with whisk attachment, beat together sugar, eggs, oil, applesauce, and vanilla on medium high. Scrape sides and bottom once with spatula to incorporate all ingredients. Lower speed and slowly spoon in flour and spice mixture. Scrape sides and bottom as needed. Mix until even cake batter forms. Fold in apples chunks and fig filling (fig filling optional) with a spatula. Divide batter evenly amongst the 3 prepared pans. Bake 20 to 22 minutes, or until toothpick inserted comes out clean with only small crumbs. Place pans on wire rack to cool for 10 minytes. Invert pans and remove cake layers. Let cool Completely. Clean bowl of stand mixer. Using whisk attachment whip butter until light and fluffy. Add cream cheese chunks and cream together until smooth. Pour in honey and vanilla, mix on medium low until incorporated. Spoon powdered sugar in a cup at a time, mixing until thick white frosting forms. Grab your cake stand or serving dish and dollup a half dollar size of cream cheese frosting onto the center. Add top layer of cake trimmed side down. Cover with maple cream cheese frosting frosting. Add butter coconut sugar, and honey into a small sauce pan over medium-low heat. Stir until sugar dissolves, mixture turns to liquid and starts to bubble. Add vanilla extract, continuing to stir. (If becomes to thick, add a tsp of milk at a time, but don’t thin it too much. For this recipe I did NOT need any milk added). Caramel will thicken as it cools, so make right before decorating. Sprinkle walnut pieces edges of cake, inside the caramel drip. Arrange fig halves in desired pattern. Thanks Dee!! I couldn’t wait any longer for fall flavors!!! Thank, I always appreciate helpful tips with new recipes. For the chai tea: do you use the liquid (tea) or the dry ingredients of a teabag? I’m quite confused ☺️ Thank you! Hello. Your cake is simply beautiful. 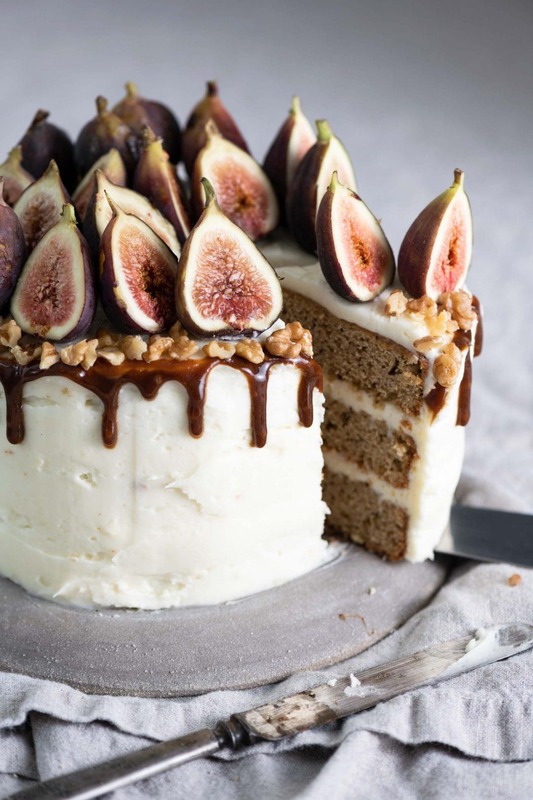 Could you please explain the fig filling in the cake; do you mean the pulp from the fruit? Could you substitute another oil for the coconut oil? 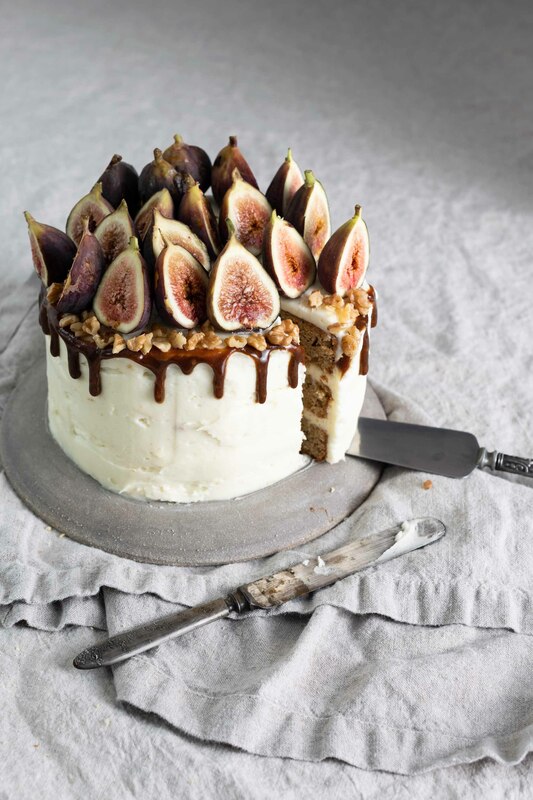 Hello Martha, Yes scrape out the pulp from the figs if you choose to incorporate fig directly into the batter. Regular vegetable oil will work for an equal substitution of the coconut oil.Let me know if you have any other questions. Happy Baking!